Meeting with a patient was rarely a predictable affair for Annie Hennigar (1873-1950), who in 1906 became one of the first female graduates of Dalhousie's School of Medicine. 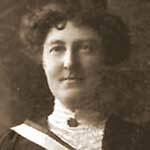 While most of her female colleagues at the time practised in towns or worked as missionaries, Dr. Hennigar chose instead to take up a horse and buggy and become a travelling country doctor — the first woman in the Maritimes to do so. The notion of a doctor making house calls may seem quaint today, but Dr. Hennigar’s experiences show it was anything but. Wildlife encounters and extreme weather were just two of the challenges. "My 'Horse and Buggy Days' were full to overflowing with hardships, thrills, dangers, determination and profit,” she wrote in a note near the end of her career. “In looking back, I would not have missed that period for a cool million." Born in Hants County, Nova Scotia, Dr. Hennigar funded her education at Dal with money she had saved up during her years as a schoolteacher in her home village of Noel. The historian of her med school class remembered Dr. Hennigar in the Dalhousie Gazette as someone who "never took cold feet no matter what the task,” which may explain why she thrived as a country doctor when she returned to Hants County. "Amputations, fractures, dislocations, tonsillectomies, extraction of teeth, etc., all came my way and I was simply put on the spot as there was no one else to do it,” she would later recall. In one case, Dr. Hennigar had to resort to using her own dining-room table to operate on a man whose hand had been chewed up in a threshing machine. With the help of an assistant and her husband, she managed to shift the man's bones back into place and sew him up, preventing an infection and allowing for a full recovery. The man was one of many Nova Scotians who likely owe their lives to Dr. Hennigar.